The visitors still have a glimmer of a chance of hauling themselves out of the bottom three but with five games to go they would need to hit title-winning form to do so after falling to their 23rd defeat of the campaign. An anxious moment for Brakes as Aaron Chambers goes close from a left-winger corner. The win gave Leamington a huge boost in their bid to seal a third season of National League North football and though they are not quite mathematically safe just yet they are incredibly close. The afternoon was always going to be fraught with nerves for those on both sides with what was at stake and a predictably cagey affair ensued. Jack Edwards picked up an early booking for a late challenge which limited his impact on the game as both sides struggled to gain the early initiative. Jordan Murphy almost snatched it for Leamington as he got goalside of Matthew Regan inside the box but the defender retaliated with a fine block challenge as Murphy attempted to shoot. Contrasting emotions after Reece Flanagan breaks the deadlock. Ahmed Obeng then displayed good composure to come through a couple of sturdy challenges, the ball running for Callum Gittings to turn and shoot tamely into the arms of keeper George McMahon. A crunching challenge in midfield from Junior English allowed Murphy to pick up possession and he moved the ball out left to Connor Gudger, who played an inviting cross into the box which McMahon twice failed to claim, his skipper Aaron Chalmers bailing him out by hacking the ball clear. Ashton’s first corner of the afternoon sailed over a crowded penalty area and out of play, while Gittings was presented with a good opportunity as first Edwards then English manoeuvred the ball into his path from a free-kick, but the midfielder thumped his first-time effort high over the bar. Ashton began to apply pressure of their own and their first serious foray into the Leamington penalty area resulted in a brief scramble. Chalmers then sent a scissors kick over the bar as the Brakes defence struggled to clear the danger. Junior English gets caught up in a late confrontation. Some superb footwork in the centre circle from Murphy to win possession allowed him to drive out to the left wing and move forward before sending in a dangerous cross which Chalmers won just ahead of Colby Bishop. Liam Tomsett was afforded the time and space to turn on the left edge of the penalty area to curl in a shot that was straight at Tony Breeden. The final action of a disappointing first half saw Gudger float in a cross which was put behind at the far post. From the resulting corner, Gittings thundered in a stinging volley which caught Ashton defender Toby Lees full in the face. To his immense credit the defender did not stay grounded for long and continued without treatment. 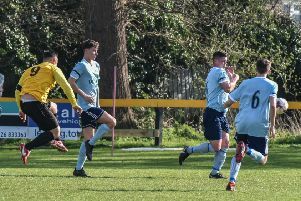 Obeng came close twice at the beginning of the second half, first beating his man on the left and advancing into the box along the touchline before rolling a weak effort into the arms of McMahon. He then turned and drove a low effort towards goal from the left edge of the box that was equally as straightforward for the keeper. Sam Sheridan came closest to breaking the deadlock when he surged down the middle unchallenged before unleashing a piledriver which clipped the top of the crossbar. Leamington felt they had a reasonable shout for a penalty when they launched a swift counter-attack from two misplaced passes in midfield. Gittings found Obeng on the edge of the box and as the winger attempted to flick the ball past Ashton right-back Javid Swaby-Neavin it appeared to strike the defender on the arm. Referee Ben Speedie perhaps was not best placed to view the incident and disagreed with the appeals. Brakes were again doing most of the attacking, with Obeng seeing another effort blocked. However, Chalmers then came close for the visitors, glancing a header across goal and just wide from a left-wing corner. Flanagan was introduced in place of Edwards with 67 minutes played and he almost made a pivotal contribution with practically his first touch, curling a free-kick a whisker wide of the upright after Obeng was fouled 25 yards out. He was lurking in the right place to grab the vital goal minutes later, however. Murphy was the architect, skipping past Swaby-Neavin on the left before driving a shot in from the tightest of angles that was parried back into his path by McMahon. His second effort escaped the grasp of the goalkeeper and covering defenders and Flanagan was quickest to react, turniing it home to the delight of the home support. There was a spot of handbags by the away dugout which resulted in bookings for Chalmers and English, but Leamington were able to hold on to their slender advantage fairly comfortably save for a scare when Swaby-Neavin’s fine ball in from the right met by Tomsett, who could only direct his shot straight at Breeden. There was another scramble before the final whistle when Brakes were able to let out a collective sigh of relief at a job almost done. Brakes: Tony Breeden, Junior English, Connor Gudger, Joe Clarke, Jamie Hood, James Mace, Jordan Murphy, Callum Gittings (Sam Wilding, 72), Colby Bishop, Jack Edwards (Reece Flanagan, 67), Ahmed Obeng (Elliot Hodge, 76). Subs not used: Jack Lane, Connor Taylor. Ashton United: George McMahon, Javid Swaby-Neavin, Matthew Regan, Aaron Chalmers, Toby Lees, Scott Kay, Sam Sheridan (Kallum Mantack, 65), Liam Goulding, Craig Hobson (Jamie Reed, 75), Connor Dimaio, Liam Tomsett. Subs not used: John Roberts, Paul Ennis, Adam Freeland.